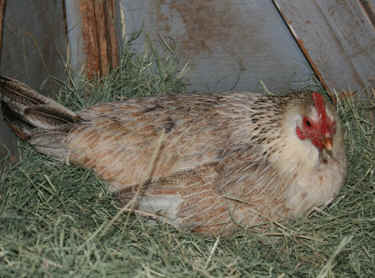 Daisy was one of The Gentle Barn's first chickens. There was a woman who had a lot of animals and lost her job and her house. I found her living in her car with about 30 chickens, some cats, two dogs and a goose. I asked if I could lighten her load and help her out. When we took her animals to the safety of The Gentle Barn, the woman was relieved and able to focus on getting back on her feet again, which she did. Daisy was always beautiful but did not like being held or pet, so every day I would tell her how beautiful she was and how much I loved her, but I always respected her wishes and did not try to hold her. Every day I would collect the eggs because if I had space for more chickens I wanted to rescue them, not create more. Every time I would take Daisy's eggs away she would get so angry and chase me around the yard yelling at me. Daisy really wanted to be a mom! One day I could not find daisy, and she went missing for about 28 days. Even though I looked everywhere I could not find her. One day about a month later, Daisy came out of hiding with a beautiful chick. I will never forget the look on her face; she looked so proud and triumphant! Daisy was a great mom and doted on her son all day, every day. I'll always remember the sounds she made to her baby. She had a specific sound when there was danger and he would dive under her wings for safety. She had a completely different sound when she found something tasty to eat and he would come running happily and gulp down the prize. When Owl grew into a very handsome rooster he became king of the barnyard and all the hens followed him around and adored him. He would make the same sounds Daisy made to him when he was a baby and he would watch with satisfaction when the hens would come running and eat his found treat. He would never eat himself, only watch with pride as they enjoyed the meal. About a year ago Daisy started following me around and putting herself in front of me, as if she was trying to say something. It scared me because she never liked being held, but it seemed as if she was asking me to pick her up. So I took her to the vet and sure enough she was very thin and her abdomen was filled with fluid. Because she was now 12 years old, which is old for a chicken, she was not a good candidate for surgery, so the vet drained the fluids and put her on some meds. From that day on she seemed to surrender and allow us to pick her up, pet her, feed her, and she would meet us at the gate of the barnyard and follow us around. We gave her nutritional supplements and special food to help her gain strength and weight. It seemed like the more we helped her feel better the more affectionate she got until she was demanding being held by all of us. Daisy spent the last 6 weeks of her life sleeping in the heated Gentle Barn office, being fed grapes and all kinds of special treats, and being cradled, rocked and held by all our volunteers. This week Daisy passed away in her sleep at the age of 13, which is the equivalent of about 100 years old for humans. She seemed so peaceful, happy and ready to go. She looked as if she had quietly, unceremoniously slipped away when she was ready. She had a picture perfect life, one in which she was respected, got to be a mom and raise her son, and got to have a deep, loving relationship with us before she went. It is difficult to imagine The Gentle Barn without Daisy; she has greeted the morning and ended each day with me for the past 12 years! But she was one of the lucky ones, a chicken that knew freedom, respect, love and kindness. I wish more chickens could live like she did. I also wish more people could have met her; her quiet good natured ways, her love of life, her happy sounds and her full language. For those of us who did know her, our lives will never be the same, forever changed! She peeped her way into our hearts and even though she is gone, a part of her is still lodged there, in our hearts forever more!